was established in march 2015. it has so far given 10 concerts- at IHC, IIC, CSOI, defence colony club, jor bagh ladies association, KAROL BAGH WOMEN'S HOME, At iit delhi alumni association musical evening, INDIA INTERNATIONAL CENTRE, JOR BAGH COMMUNITY CENTRE. it presently has about 16 members male and female, aged 10 to 65. 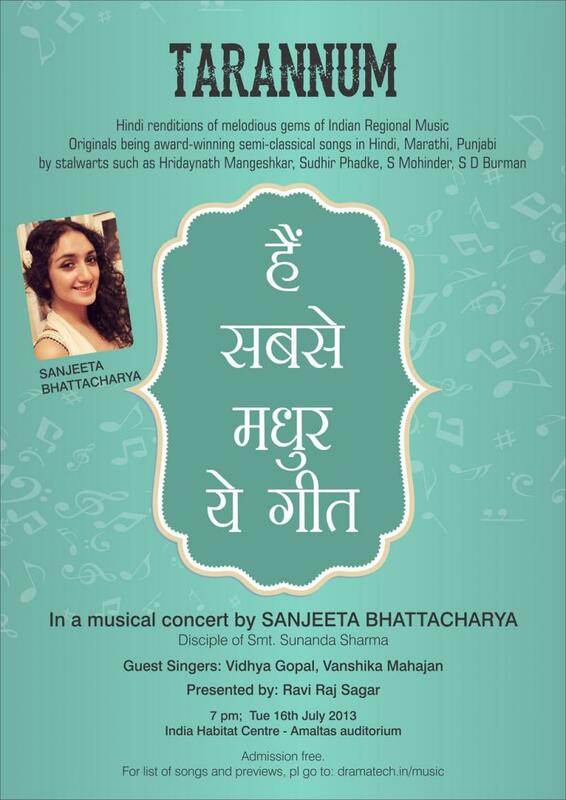 ITS REPERTOIRE INCLUDES DEVOTIONAL, PATRIOTIC, REGIONAL, FOLK, AND OLD HINDI CLASSIC SONGS. 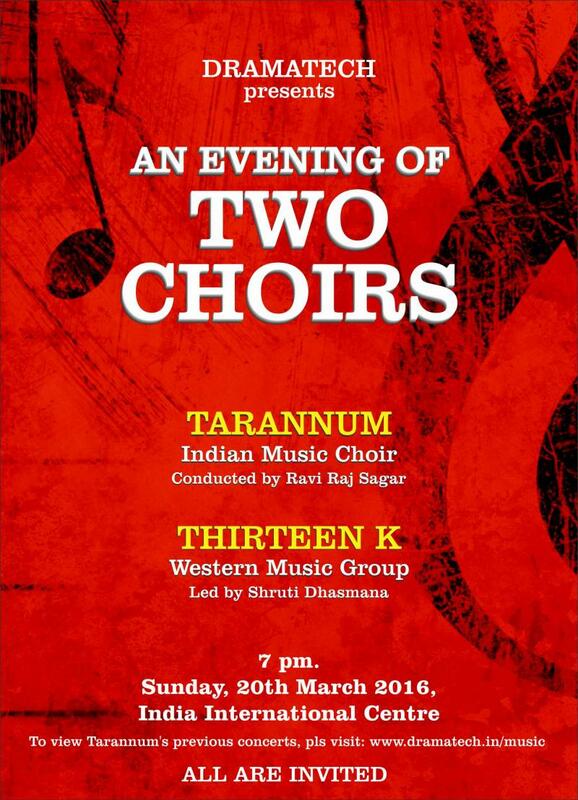 TARANNUM HAS ALSO HELD SEVERAL CONCERTS, BOTH INDIAN AND WESTERN. This was launched recently with a Christmas Carols concert at Hotel Claridges, New Delhi on Christmas eve, Dec 2015, with 9 adult and 6 child singers. Good singers are invited to join. Practices every wed afternoon at GK I, New Delhi. Please write to: music@dramatech.in giving details of singing background, concerts done (if any), etc. Western Music Concert by DELHI GENESIS CHOIR conducted by ACHING SHAIZA. 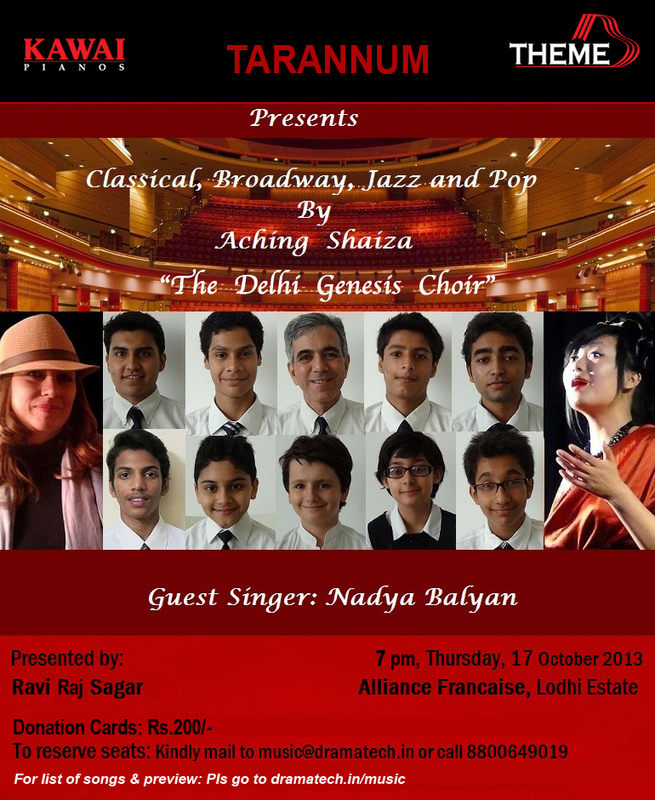 On Thurs 17th Oct 2013 at Alliance Francaise, Delhi at 7 pm. Façade from “Jekyll and Hyde”, Frank Wildhorn. “Gretchen am Spinnrade”, Franz Schubert. 4. Duet “Music of the Night” from Phantom of the Opera, Andrew Lloyd Webber. Valse op.64-1 “Petit chien”, Frederic Chopin. Leonard Bernstein and Stephen Sondheim. “Ave Maria”, Wolfgang Amadeus Mozart. “The Flower Duet” from Lakme, Leo Delibes. “Prelude: Legend” (Asturias), Isaac Albeniz. “Confrontation” from Jekyll and Hyde, Frank Wildhorn. 13. Quartet with Parnika Nangla. (Musical). “I’ll do Anything” from Oliver, Lionel Bart. “Pretty Woman”, Roy Orbison and Bill Dees. “Blue Moon”, Richard Rodgers and Lorenz Hart. “O sole mio”, Giovanni Capurro and Eduardo di Capua. 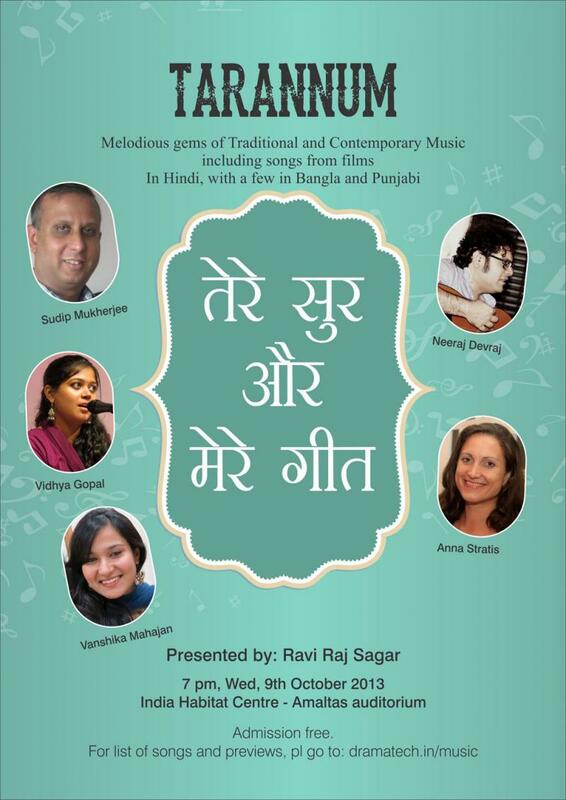 Concert TERE SUR AUR MERE GEET: 7 pm, Wed 9th Oct 2013; India Habitat Centre, Delhi. Admn free. 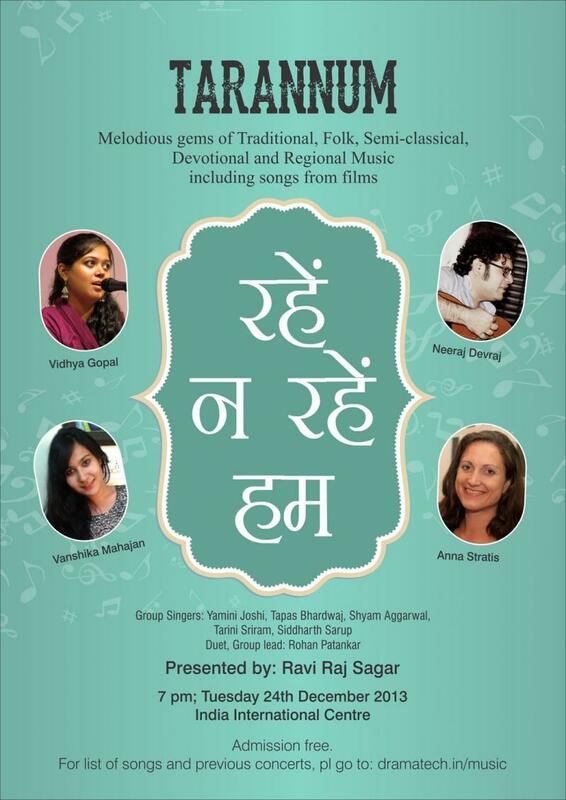 Melodious Semi-classical - Folk -Devotional and Modern songs by Sudip Mukherjee, Neeraj Devraj, Anna Stratis, Vidhya Gopal, Vanshika Mahajan. Presented by Ravi Raj Sagar. 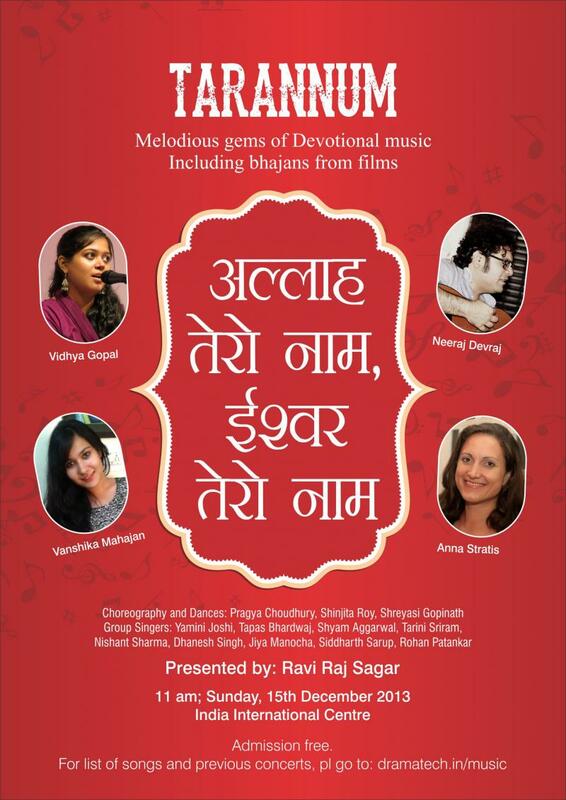 Preview for Tarannum concert on 9 oct 2013. 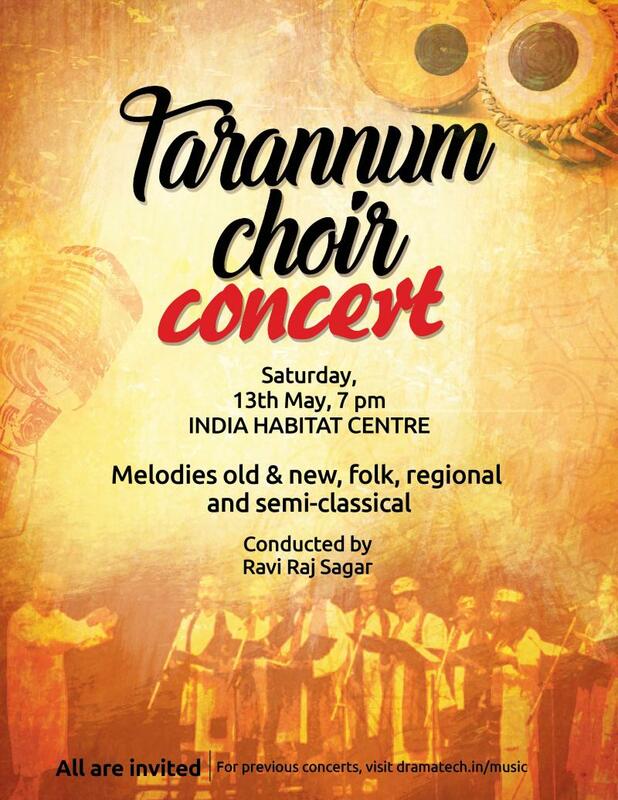 Preview of Tarannum concert on 9oct2013. 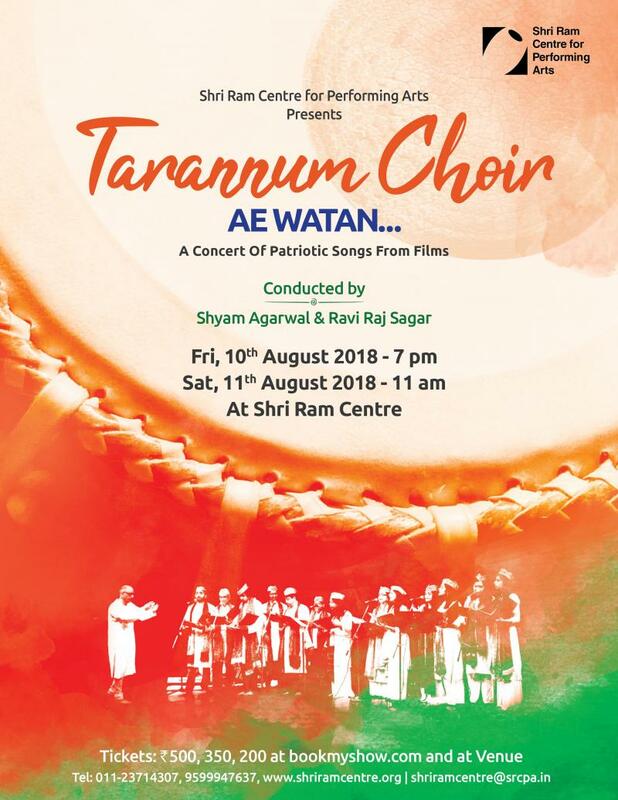 GOOD SINGERS INVITED FOR TARANNUM INDIAN MUSIC CHOIR, DELHI: Good singers may write attaching a short song recording to: music@dramatech.in Our Indian music choir practices every Sunday afternoon in Sarvodaya Enclave, South Delhi, (nearest station Haus Khas), and has given 10 concerts in its first three years, the last ones being at Sri Ram Centre, CSOI and Blind Relief Association, Delhi in August 2018; India Habitat Centre in May 2017; CSOI in Dec 2017, India International Centre, Delhi in March 2016. And short concerts at ONGC, Vasant Kunj and LinkedIn, Gurgaon in Nov 2018. Our next concerts will be in March-April 2019.﻿. 'Awaz do hum ek hain' patriotic song at Defence Colony Club, New Delhi June 2015. 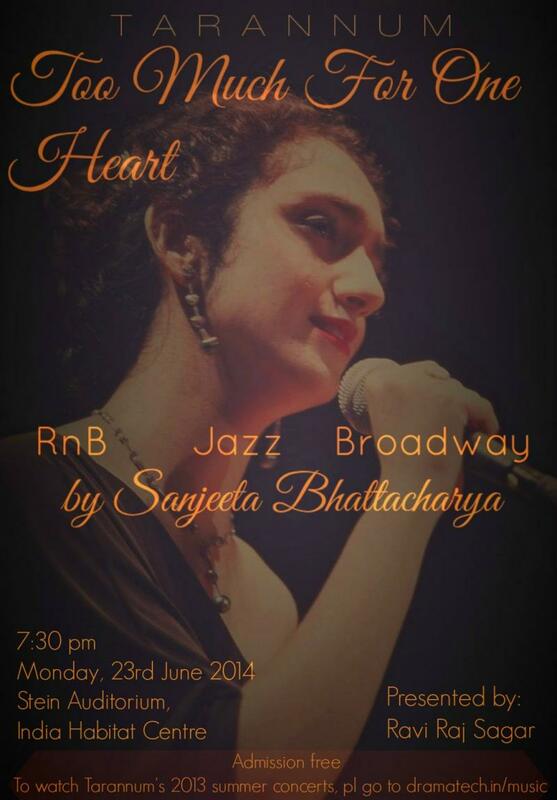 A concert of Indian Music by Sanjeeta Bhattacharya. Tue 16th July 2013, 7 pm; India Habitat Centre, Delhi. Take an ethereal selection of melodies by legends of Jazz and Soul- The First Lady of Song Ella Fitzgerald; The Queen of Soul Aretha Franklin; add a song each by the versatile Etta James, the popular Shirley Bassey; top it all with a few delightful numbers from Broadway - and you have an eclectic mix of renderings that would be a treat for connoisseurs of Western music. 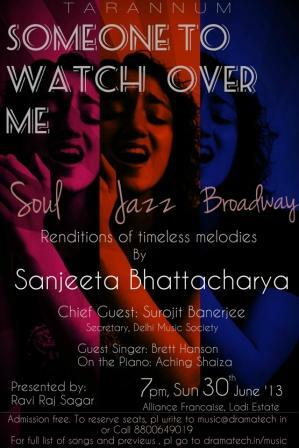 This concert will be brought to you by the young singer Sanjeeta Bhattacharya, and she will be accompanied by the acclaimed pianist Aching Shaiza. Sanjeeta has just finished her schooling from DPS, Vasant Kunj and has been accepted into Berkelee School of Music. Reputed to be a singer with a wide range and a voice that spans from the soulful to the enthralling, Sanjeeta’s concert will be a unique addition to the capital’s repertoire of Western music. Joining her will be guest-singer Brett Hanson, who has a rich experience in musical theatre in United Kingdom. The program is being presented by Ravi Raj Sagar, the eminent stage Director of acclaimed musicals Fiddler on the Roof, Hello Dolly! and The Weekend Cocktail. 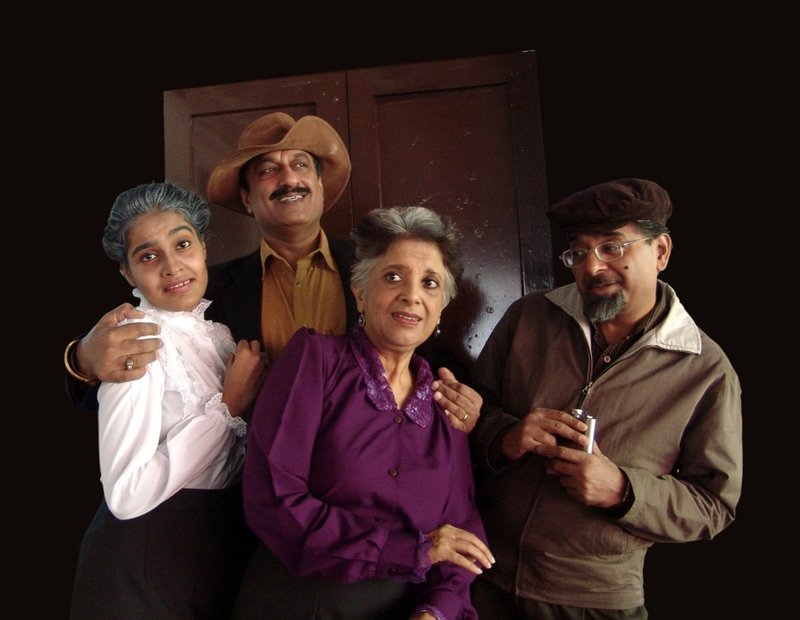 Still from play EK JAAM AUNTIYON KE NAAM (hindi of Arsenic and Old Lace), Sri Ram Centre, 2008. Selected among Sahitya Kala Parishad's Best Plays of the Year.